If you’re looking for Spring Break ideas, the Southeast provides the perfect weather for a March escape. Prefer a nice hotel nestled in an urban oasis of activity? Would you rather slow down and feel the charm of a small mountain town? Or perhaps, you want to completely unplug and gaze at the stars in the night sky? These destinations have something for everyone. Enjoy an easy scenic hike, go apple picking or antiquing, pitch a tent, or explore the local shops along a charming Main Street. We’ve chosen 6 destinations, all within a 4 hour drive from Charlotte, where you can experience a fantastic weekend getaway, whatever the season, whatever the reason. Each of these destinations highlights a nearby mountain town that offers great local food and shops with terrific indoor and outdoor activities. Something for everyone. No lodging research needed or activities to plan out-- it's all covered in detail here, saving you time and effort that you would rather spend on your vacation, not planning it. With the approach of fall and the promise of cooler nights, it’s time to dust off those tents and take the family camping! These 5 campgrounds have the distinction of being perfectly terrific just on their own or as a base camp to explore nearby towns or trails. All within 2 hours of Knoxville. There’s just something about the constant and reliable enjoyment that each day at the beach brings. Wake up, say good morning to the ocean, assume beachfront position with book, and watch the kids play in the surf and build sand castles. Rinse and repeat. Two of my favorite family hikes are located on the Blue Ridge Parkway near Blowing Rock, NC. I have to admit, however, that I will always choose these hikes with or without the kiddos. They are just that good. Both Rough Ridge and Flat Top Tower trails offer incredible vistas of the Blue Ridge Mountains and are worth every step. It may be our mid-life crisis. My husband and I are obsessed with adventure camper trailers. We want one. We don’t want your typical “RV type” trailer that you pull behind your truck. We want a super light-weight, go anywhere, down any forest road, cool looking, tough, off-road camping trailer. We want tent camping combined with “glamping” amenities. We imagine super easy “pack up and go” family camping trips to quiet forests isolated from humans and surrounded by the sounds of nature and our happy children. Cue rainbows and unicorns here. 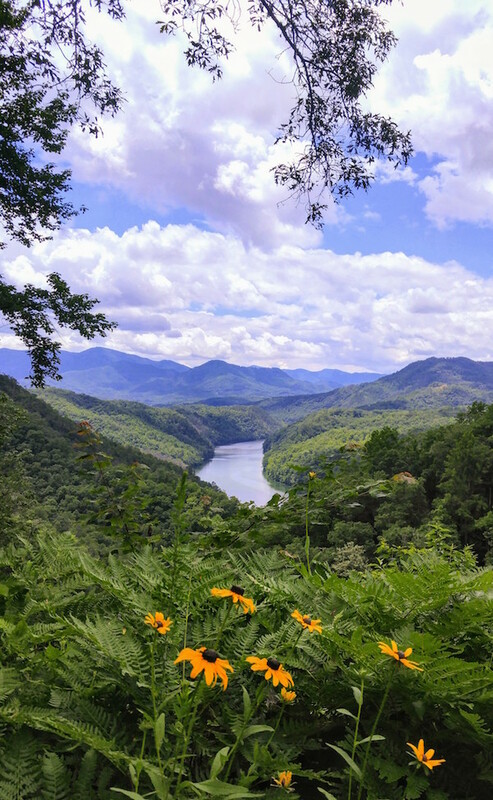 Bryson City is a fantastic mountain town in western North Carolina that seems to fly under the radar of most visitors to the Great Smoky Mountain National Park. It's an excellent home base for a fun weekend any time of year. With its brilliant fall color display and the diminishing crowds from summer, now is the perfect time to check out this beautiful town. The hot temperatures have subsided, the leaves have started to turn, the apples trees are ready for harvest, and the water cooler talk has turned to college football. It must finally be fall! Now is a great time to get the family together to enjoy an easy scenic hike, go apple picking, pitch a tent, or stroll down Main Street. So pack up the family and check out these 3 great fall getaways to Asheville, Brevard, and Bryson City, NC.